BOOK ONE – WHO’S WHO IN THE COSMIC ZOO? This is the most informative book I have read on the ET phenomena. Ella LeBain goes to great depth in reporting the results of her extensive research and analysis on the subject. This is a must read for anyone with the slightest interest in visitors and the impact they have on humanity. 5.0 out of 5 stars — A Great Alternative to David Icke! The subject matter here is in similar vein with David Icke, Tom Horn, or David Flynn, presented from careful research and firsthand witness accounts. Topics range from little known encounters to the major stories of 2013, detailed, timely and inclusive of overlooked points of view. Though a little long, the book is well organized and easy to peruse. What I really liked most about this book, and where it soars above Icke and Horn and Flynn, is its’ powerful message about humanity’s position regarding the aliens, UFOs and spiritual entities. I can recommend this to anyone interested or concerned about High Strangeness without fear of their becoming despondent or overwhelmed or frightened by all the implications. Instead this work presents alternatives to the powerlessness and paralysis resultant from most other books on the subject. Definitely upbeat and encouraging, a breath of fresh air! I have read this book and it is simply amazing the book does wonders and if you ever want to know everything about the bible aliens extraterrestrials demons this is the book to read.it has it all everything you ever wanted to know about aliens technology what is to come what has happened in the past you must get to the book this book is simply out of this world no pun intended. This book prepares you for what is to come. A must read!!! Fantastic book. Very well written. Obviously, the author spent an amazing amount of time on research. If you have ever really wanted to know about what’s “going on”, read this book. It will open your mind. Love the series and delighted with the new book. Received it very quickly. It’s a very eye-opening book and can’t put it down. Thank you Ella LeBain for your amazing work. A quality book that is put together well. I found it to be a good read as well as a handy reference. It contains a wealth of information that one needs in this day of deception and counterfeit gods. Ready for book two! Thank you Ella. 5.0 out of 5 stars — What isn’t to like about this book? 5.0 out of 5 stars — Brilliant! Although I have just started to read this book and have only a basic knowledge of the topics covered within, nonetheless, I am already fascinated. Not only has the author put a tremendous amount of serious research and work into this book, but it is also written in a way that even those like myself, without much knowledge on the topics of ET’s Aliens, Gods and Angels, can understand and enjoy reading it. A serious and intelligent book, that will no doubt open my mind, in more ways than one. I highly recommend this book for anyone who has an interest in the mystical and spiritual realms, as well as extraterrestrial. 5.0 out of 5 stars — If you want to believe this book will help you get there. This book certainly opened my eyes to the probability of many more alien species visiting and even living on our planet Earth than I had previously thought. The author has provided extensive research on the subject along with some of her own experiences and insights that also include how all of this fits into the larger picture of the battle between good and evil in a spiritual way which I had not personally given any thought to until reading this book. 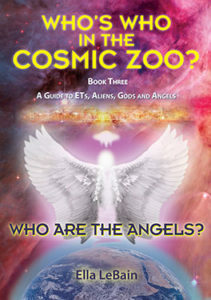 If you want a good source book on aliens in our cosmic zoo along with some insights that may provide you with some intriguing possibilities to ponder on then I recommend you get this book and see what it does for you. 5.0 out of 5 stars — A great read!! This is an extremely well researched book, and very well written. If you’ve ever wondered about mankind and its real origins, this will give you some great insight. All of us know that something is not quite right, and this will give you the answers to your questions. This isn’t your normal gobbly gook about UFOs, but rather a good perspective on what’s really going on with humans and “others” who are really running the show. 5.0 out of 5 stars — Hands down relevant in this hour!! From the first page to the last its apparent that the author has done her homework. Bravo! And praise to our Lord Jesus Christ.!!! He lives!!! I simply could not put the book down. I read the majority of it in the weekend that I first received it. Compelling and in depth simply don’t completely describe this book. I really appreciated how she tied in appropriate scriptures into the narrative. Great book. Read it. I cannot wait for book two. Thank you Ella. BOOK TWO: WHO IS GOD? 5.0 out of 5 stars — Who IS God- find out in this something for everyone book! Ella is obviously very well versed in God, the Bible and the history of religion. Her breath of knowledge in this subject is amazing. She has some very interesting points and explains them thoroughly and her information is well cited. Her second book “Who Is God” is broken up into sections inside the chapters on many different topics giving the reader a chance to read what may interest them at that time and go back to another topic later on. This worked for me as I could digest what I had read in a chapter without getting bogged down or overwhelmed by information and could stop for a while without losing the thread of what I was reading. I will be reading it for a while, and that is a good thing. Comment| 6 people found this helpful. Was this review helpful to you? 5.0 out of 5 stars — Glad I got this one! This book is an encouragement! It presents a clear and well-argued case for the need for differentiating between angels, ETs, ultraterrestrials, UFO- nauts, and apparitions. The anomalies and contradictions in the whole UFO mystery are laid out, examined and put into an understandable perspective. Real evidence is presented from archeological research, oral histories, current events, Scripture, as well as from first hand eye witness accounts as to why the human race is being threatened, and by whom. Rational, organized, and logical, the book follows the thread through the deliberate confusion and obfuscation by governmental, religious, and even scientific bastions to shed usable light on a sensitive subject. The best of Who Is God? is the Christology; solid, pure and intensely alive! The author shares a living faith, walks her talk, follows her Lord through every paragraph. Not only informative, but a joy to read!! I am glad I got this one! This author brilliantly pulls a plethora of research together in order to discern who God is through all the religions, and why they differ. I enjoyed how she connected the dots to the Ancient Alien theory, as well as Ancient Scriptures. This is one heavy duty subject which requires individual study and prayer. Clearly humanity has been messed with by numerous ancient gods of the past, who compete over power, through religion and warring political agendas. The author was able to identify the good God from the many counterfeit gods in this treatise. I enjoyed this author’s research proving mistranslations and mistransliterations from the Bible causing cults and false beliefs. I think the author did a great job presenting all the facts, evidence and knowledge from ancient sources by delivering an important discernment and message to those seeking God, Spirit and Truth. Therefore, I would highly recommend this book, to every seeker, and especially to the skeptic and atheist. I especially enjoyed the author’s perspective on atheism, that there is really no such as an atheist. She cleverly proves that through scripture and history. Religious wounds from religious abuse has left deep psychic scars within the soul, to cause a spirit of unbelief to blind people to reject God. Also typically, those who have had broken relationships with their parents, particularly the father figure, has also created atheistic viewpoints. I loved how the author proved that the Creator God is imprinted within its creation and that religion doesn’t necessarily foster a right relationship with the Creator, which is why so many religions are flawed and actually turn people off from God. I want God, not religion, and this book discerns how important those differences are, especially in the Bible itself. Looking forward to the reading the next book in this interesting book series. I was so blown away with this book and all its information about God. I loved how she spent time showing the true spelling of God’s Hebrew name and how it fits perfectly with Jesus’ name. I would highly recommend all of Ella’s books but this one is very important if you desire to know God’s real name. Very interesting stuff here. Very enjoyable. 5.0 out of 5 stars — Delight in this book! After reading the authors first book I knew I had to read her second offering made manifest in this book. If you are looking to investigate and increase your knowledge in the spiritual arena Ella LeBain will have done you a great service in providing you an intensive and thorough book of research combined with personal knowingness and intuitive insight that will hopefully take you on a journey of increased awareness in which you may personally delight in the growth of your mind and soul’s inner light. Whatever you may take away from this book as accounted treasure for your own personal journey forward into life know that it has been given from the mind and soul of an author with a purpose engaged with love to serve you in your further enlightenment. I heartily recommend this book for you to read knowing you will come away with so much in true value in it as a buffet for your soul. 5.0 out of 5 stars — Who is God? I was initially intrigued by the original title. 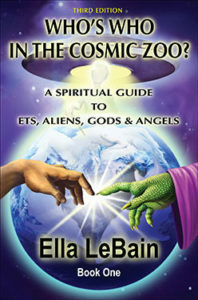 Ella truly gives the reader “A Spiritual Guide to ETs, Aliens, Gods, and Angels”. 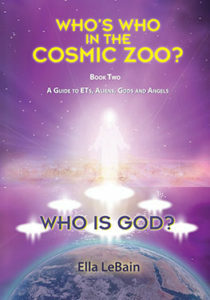 Next time you look up in the sky and see something you can’t explain think of “Who’s Who in the Cosmic Zoo?” Great Read! The second book “Who is God?” takes the reader on a journey through the history of the world’s major religions and questions if they are all worshiping the same one God. Ella also gives us a fresh perspective on the actual meaning and words in the scriptures many having been misconstrued or lost in translation. You’ve captured my attention! Ella is a rising star who shows wisdom and understanding far beyond her years. Who is God? is her 2nd book and continues to amaze me with her dedication to increasing our awareness of the time we live in. Congratulations Ella – please continue to shine the Light. I have read through this wonderful book and I must say that Ella’s insight regarding God and who He is, angels, aliens and ETs is vastly interesting, and makes a lot of sense both biblically and physically. Before this book, I never really thought about some of the supernatural details that she touched upon, and now, after reading it, I feel more enlightened and educated about the mysteries of the universe. I am truly looking forward to more of her books! She is a 5-star author all the way! So well done, so brilliant and ONE of the small books that must be opened in these last days. I read it all this morning. I believe this book is divinely inspired and you are among the FEW WHO GET IT. MY BLESSINGS. I love this book and it has so much information and I tell all Christians to look into the meaning of the white horse. A MUST READ Book for all truth seekers. 5.0 out of 5 stars — Another Masterpiece! Just as outstanding and as mind blowing! 5.0 out of 5 stars — Yahoo for Who’s Who!! Couldn’t wait for this author’s second book and it was worth the wait! Extremely revealing and a worthwhile read. A very interesting, researched approach to many questions we have all considered. Thought provoking, and a good read! Prolific, inspiring author! Fascinating topic! A well-researched and well written volume giving a unique insight into the unseen. Incredible book, incredible author! A must read! BOOK THREE: WHO ARE THE ANGELS? Comment| 3 people found this helpful. Was this review helpful to you? This book on Angels is probably the most comprehensive research book ever written on this subject. Her scholarship is undeniable, she really did her homework as my wife is fond of saying. I heartily recommend this book to anyone who is truly seeking for the truth about supernatural creatures called Angels. No matter whether you agree with all or any of her premises this book will challenge and stimulate you to the enlightened truth about God’s mysterious beings. I now will be buying the rest of Ella’s books. God bless, Billy B. 5.0 out of 5 stars — Will fluff up your mental wings with knowledge and set your mind to fly! Extraordinary Book! Ella LeBain is quite the researcher with a gift for putting it all together in a quite readable fashion to stimulate your interest and fire up your memory banks with some worthwhile knowledge. You will be glad you bought and read this book if this is a field of interest for you. There is so much you can find out about in this book its value far surpasses its cost for the reader that is hungry to learn more of the cosmic realms. 5.0 out of 5 stars — I learned a lot! I really got a lot out of this book. Nothing made up, no incantations, but well researched and real information from multiple sources. The explanations for angelic visitation are clear and backed up by Scripture, the Book of Enoch, and scientific researchers. The flow makes a very complex subject understandable. The author includes plain and testable ways to be certain that these angelic contacts which people pursue are in fact angels and not phantoms. I learned a lot! And I really enjoyed the read, not too over my head and not a sermon in disguise either. I am definitely going to get the next in this series. This is the third installment in five-part series and really opens one’s eyes to the unknown realities being played out, unawares to the majority of the populace. Will definitely keep on exploring as this has awoken more curiosity from me. I love angel books, but this one is phenomenal. There is so much information. It’s totally spell-bounding and I love it, I love it, I love it. Can’t wait for more and looking forward to the 4th volume. You have such incredible knowledge, can’t get enough. Thank you for writing these wonderful books. This is the best Seller Book I’ve ever read!! Mrs. LeBain is the best author I’ve read. Keep up with the great Writing Love you girl!!! 5.0 out of 5 stars – Her best work yet! I really think this book is going to be the Break Out book; it isn’t about dull law stuff, it’s about witchcraft and spirits and all the things people WANT to read about!!! This is The One!! I know it!! I am really excited about this one. It is intriguing!! This is LeBain’s best book yet! This one is the best, the most informative, and one of the most interesting books so far, and not just by you. I am ordering 5 paperbacks when they come out!!! 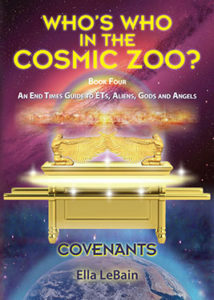 I enjoyed Book 4 enormously and am very interested in The Heavens. I can’t believe that Ella has done it again. Not only has she done her research, but she has truly packed this book with an amazing amount of intelligent, well thought out premises concerning life surrounded by the supernatural and how we are impacted through the various covenants that we make. When I first started to read the Kindle version of this book I kept hearing Proverbs18:21- “Death and life and are in the power of the tongue, and those who love it will eat its fruit.” Our words certainly contain power that serve to make contracts and to cause either death or life to manifest toward us. Ella certainly delivers on these points and challenges all of her readers to have their paradigm shifted concerning our views of life in our cosmos.